"Dean's not home right now. Please leave a message." One thing about Supernatural: no one is happy for long. And there is no situation that can't get more complicated. Archangel Michael is good at distraction. He is amused by setting people against each other with believable lies, much like a handsome male Nurse Ratched. Although he did finally reveal his core motivation. Like Lucifer, Michael has father envy. He wants to kill God/Chuck and take over. Was Michael right that Chuck creates entire worlds (churning out draft after draft) and then leaves them when they don't quite work out? At any rate, if Michael was able to get out of those handcuffs as he kept suggesting, and didn't in order to keep them all off balance, then wow, did he make a major error. 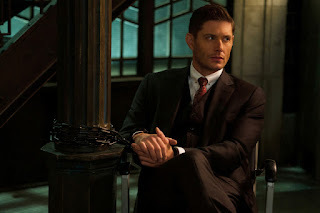 And now he's trapped in a walk-in bar fridge in Dean's mind, a most unpleasant cage, to say the least. Unless Michael likes beer. I don't think he does. Michael feels like a wine guy. It was nice to see Dean happy, wasn't it? I enjoyed the repeating loops in Rocky's Bar. (I assume it was "Rocky" because of what Crowley used to call the boys, which is adorable.) It was really nice to see Pamela Barnes again, although I kept wondering, why Pamela? Why not some form of Sam or Castiel or Mary, or one of Dean's love interests from the past, like Lisa or Jo? Or all of the above? Was it because Dean would have realized they were fakes? He never knew Pamela that well. Yay for good continuity, bringing back the British Men of Letters "head thingy" from "Who We Are." And it was clever, Sam finding Dean in the bar by ignoring lines from old episodes when Dean was in despair, and only listening to happy words that Sam didn't recognize. Sam knows his brother too, too well. "If I wanted to distract Dean, I'd give him something he's never had before." Like happiness. Maggie is a character that I keep expecting to die, and I wouldn't have been surprised if she'd died in this one. Instead, she managed to lead the Lebanon Alternate Universe Irregulars from Kansas City back to the bunker in time to defend it from Michael's Monsters. Except that they didn't have to, because Jack got his powers back in time to mow them all down. Except that there's a serious drawback – Jack sucked that power out of his own soul. Hey, we all knew there'd be a drawback to this soul-powering thing. Billie was the one who teleported our guys from Kansas City to the bunker in the nick of time. I thought maybe she had started liking the Winchesters, as unlikely as that seemed, but no. 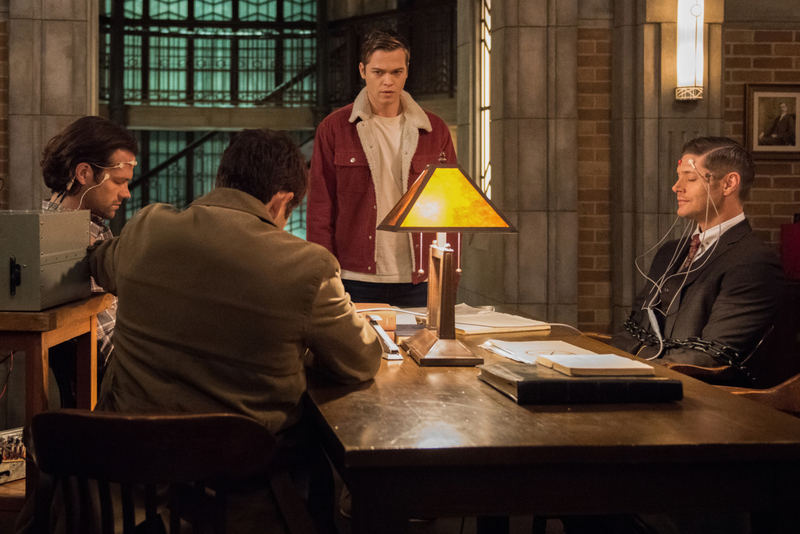 Apparently, all of Dean's death books in her "reading room" now end the same way – with Michael emerging and using Dean as his vessel as he burns down the world. Except one book, and of course, the writers didn't tell us what happens in that one. So Dean now has to save the world. That's why Billie saved him. What do you think, season finale, perhaps? Or even series finale? We still don't know if there will be another season. — The bar was obviously a little tribute to Jensen Ackles' new beer business in Austin. Dean even referred to "an IPA from Austin." IPA stands for "India Pale Ale," by the way. I didn't know that before. — Earlier in the season, I thought the dizzy spells meant that Michael was hiding inside Dean. Instead, he was just eavesdropping. — We got a Jensen versus Jensen fight, just like Star Trek. That's happened before, though. Hasn't it? Anyone remember which episode or episodes? — Again, a bit of good continuity with Sam mentioning what Gadreel did to keep him "under." — Also, "Poughkeepsie." Clever of Sam. — How is Garth doing? Maybe next time. — Jensen as Michael got to do a Castiel impression. Gotta love it. Sam: "Get him downstairs, dump him in the trunk of the Impala, take him back to the bunker." Jack: "But Garth is in the trunk." Sam: (pause) "It's a big trunk." Violet the Reaper: "My name's Violet. It's my shift. We have shifts now because you mess up so, so many things." Reapers are now monitoring the Winchesters in shifts. This time, it was a good thing. Probably not always. It doesn't seem likely that Dean will be able to keep Michael in there forever without going nuts, of course. I can think of at least one DS9 episode, The Adversary, when Odo seems to be fighting Odo. I'm less expert on the other shows. There are a couple of them in original Star Trek, of course. But I was thinking that they had Dean fighting Dean in other episodes, but I'm not sure which ones. An early shapeshifter episode? "The End" back in season five? Dean have fought himself in a season 3 episode where they went into Bobbys Dream. Later in the episode they went into Deans Dream, Saw liza and he fought himself. And now I know I know too much about This show when I just know that. I adored this episode! I'm always so impressed how this show uses its own lore to go deeper, find fresh angles and surprise us. Michael locked up in Dean's own mind is just... inspired. And the way they kept showing him banging on the door. This must be horrible for Dean. I kept wondering what happens when Dean is asleep? Will his guard be down? I also love the speculation that each alternate universe is simply a different draft from writer, Chuck. Incredible continuity and thinking. I don't know what I'll do when Supernatural is finally over. Just watched the episode again. All of a sudden, I had an idea: what if the only way to truly defeat Michael is for Dean to die. If the vessel dies while Michael is in his mind, Michael dies too. Is Dean committing suicide the one outcome where Michael doesn't get out? OMG I hope not. I loved this episode. And I couldn't help thinking throughout, Jensen must have had so much fun filming this episode!